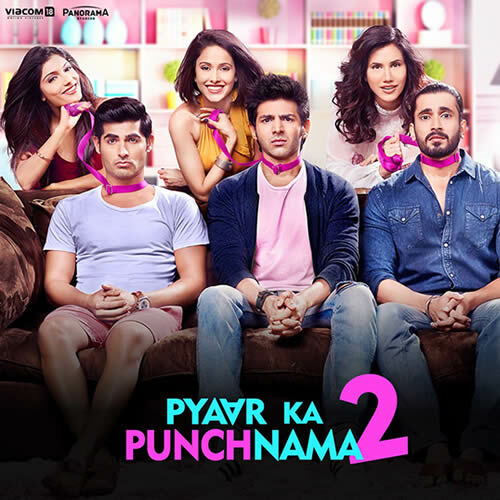 Pyaar Ka Punchnama 2 - All Songs Lyrics & Videos: It is a Hindi comedy film directed by Luv Ranjan and produced by Abhishek Pathak. A sequel of 2011 film. The film stars Kartik Aaryan, Nushrat Bharucha, Sonalli Sehgall, Ishita Sharma, Omkar Kapoor, Sunny Singh. The music for Pyaar Ka Punchnama 2 has been composed by Sharib-Toshi, Hitesh Sonik and Luv Ranjan. Lyrics are penned by Kumaar, Late Akram Sabri, Danish Sabri, Hitesh Sonik and Luv Ranjan. The music rights are acquired by Zee Music Company.